MINNEAPOLIS -- The Minnesota police officer who pulled over Philando Castile politely told the driver that his brake lights were out and calmly instructed him not to pull out his handgun before suddenly drawing his own weapon and firing seven rounds into the car, a video released Tuesday showed. The dashboard video taken from Officer Jeronimo Yanez's squad car illustrated how a simple traffic stop shifted from a routine exchange to a deadly confrontation in an instant. When Yanez opens fire, another officer near the car jumps back, and Yanez begins yelling at the driver. As more police and an ambulance arrive at the scene, Yanez can be heard breathing heavily and swearing and trying to explain his actions to fellow officers. The video was made public just days after the officer was acquitted on all counts in the case. Although the squad-car footage has been described repeatedly and was shown to jurors in the courtroom, it had never been made public until Tuesday. The shooting gained widespread attention because Castile's girlfriend, Diamond Reynolds, livestreamed its gruesome aftermath on Facebook. Unlike Reynolds' video, the squad-car video shows the situation's quick escalation and the shooting itself. Yanez, who was found not guilty of manslaughter and other charges, began firing only seconds after Castile told the officer he had a gun. "Sir, I have to tell you, I do have a firearm on me," Castile is heard saying. Before Castile finishes that sentence, Yanez begins pulling his weapon out of the holster. Yanez says, "OK. Don't reach for it then." There is shouting, and Yanez screams "Don't pull it out!" before firing into the car. Castile, a 32-year-old elementary school cafeteria worker, had a permit to carry his weapon. The release of the video made some people even angrier about the death. VIEWER WARNING! 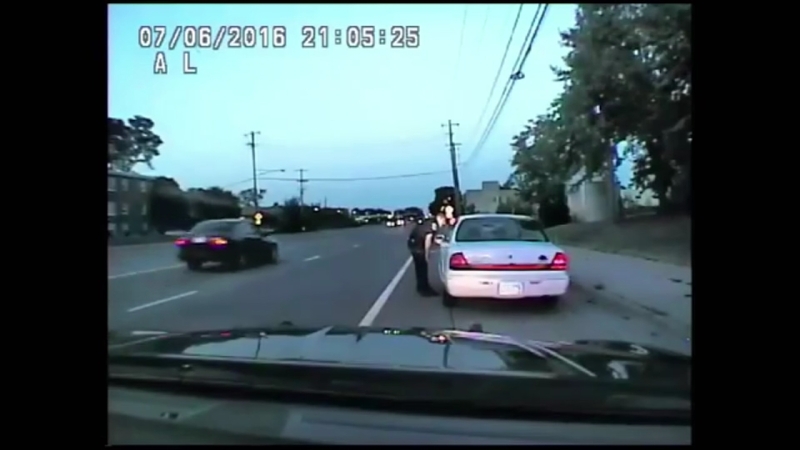 Dramatic video: Dashcam video shows officer firing 7 shots into Castile car. Steven Belton, president and CEO of Minneapolis Urban League, said the footage was "powerfully painful" and that Castile was "gunned down like a rabid animal." Bekuh Sibet, a 29-year-old waitress from nearby Richfield, said it was obvious to her from the video that Castile was complying. "I feel like it's 10 times worse now," she said. The video doesn't show what happened in the car. Yanez testified that Castile ignored his commands not to pull out the gun. The footage shows a wide view of the traffic stop and the shooting, with the camera pointed toward Castile's car. It captures what was said between the two men. The video does not show what happened inside the car or what Yanez saw. It shows Yanez, who is Latino, following Castile's car, then pulling it over. Yanez can be seen approaching Castile, who was black, and asking for a driver's license and proof of insurance. Castile gives the proof of insurance to Yanez through the driver's side window, and the officer puts it in his pocket. After the first shot, Castile's body is thrown to the right. The video shows Yanez's backup officer, Joseph Kauser, standing on the passenger side of the vehicle, retreating when the shots were fired. After the shooting, the video shows Yanez standing at the car window with his gun drawn for some time. Reynolds' then-4-year-old daughter starts to get out of the car and is grabbed by an officer. Officers order Reynolds out of the car, and she gets out, hands held high. Soon, she is heard wailing. A fellow officer speaks repeatedly to Yanez to get him away from the car: "I'm going to take your spot. I'm going to take your spot. Listen, listen, I'm going to take your spot." Yanez slowly walks away, and another officer says: "You all right? You all right? You're not hit any, are you?" Officers pull Castile from the vehicle and begin CPR. Yanez is then off-camera, but can be heard talking through his body microphone. Yanez, 29, is heard telling a supervisor that he didn't know where Castile's gun was, then saying that he told Castile to get his hand off it. Yanez testified, "What I meant by that was I didn't know where the gun was up until I saw it in his right thigh area." Yanez's acquittal prompted days of protests, including one in St. Paul last Friday that attracted thousands and shut down Interstate 94 for hours. Eighteen people were arrested.